February 19, 2016 – As of February 19, 2016, Juno is approximately 413 million miles (665 million kilometers) from Earth. The one-way radio signal travel time between Earth and Juno is currently about 37 minutes. 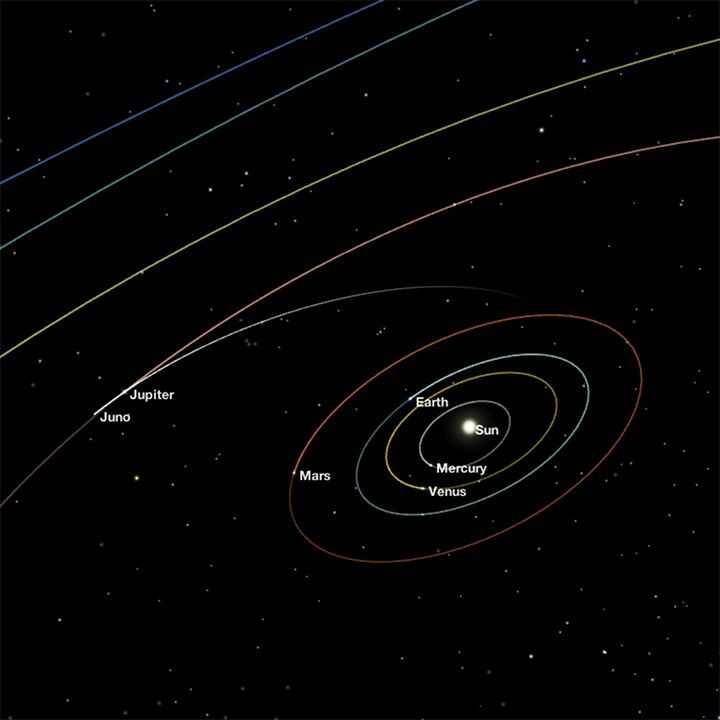 Juno is traveling at a velocity of approximately 51,000 miles per hour (about 22.9 kilometers per second) relative to Earth, 16,000 miles per hour (about 7.3 kilometers per second) relative to the Sun, and 12,000 miles per hour (about 5.6 kilometers per second) relative to Jupiter. Juno has now travelled 1.71 billion miles (2.75 billion kilometers, or 18.41 AU) since launch, and has another 48 million miles to go (77 million kilometers, or 0.52 AU) before entering orbit around Jupiter. Juno is slated to arrive at the gas giant planet on July 4, 2016, scheduled for 9:35 p.m. MDT (Earth Received Time). Visualize Juno’s journey through space and get up-to-date data sets using NASA’s Eyes on the Solar System 3D interactive. Juno’s onboard color camera, called JunoCam, invites the public to serve as a virtual imaging team. Upload and comment on which pictures JunoCam will take when it reaches Jupiter using the new JunoCam web platform. NASA’s Jet Propulsion Laboratory, Pasadena, California, manages the Juno mission for the principal investigator, Scott Bolton, of Southwest Research Institute in San Antonio. Juno is part of NASA’s New Frontiers Program, which is managed at NASA’s Marshall Space Flight Center in Huntsville, Alabama. Lockheed Martin Space Systems, Denver, built the spacecraft.